I can't believe we are almost in December.. This year simply flew by and didn't have enough months.. It's the start of the week in Dubai and everyone is running around trying to finish things up before the holidays, so it's another busy bee week which means hearty breakfast time.. As I looked through my fridge this morning I found German sausages, eggs and tomatoes.. Instead of doing the usual eggs and sausage, I decided on making this baked frittata.. Delicious! Preheat the oven to 200C (on the broiler function).. 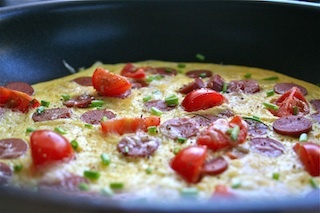 In bowl, whisk the eggs with the crème fraiche, salt and pepper.. Sauté the sausages and once they have a little color add the egg mixture.. Sprinkle with cheddar and place the tomatoes on top, keep the pan on the heat for another minute or so, then place it in the oven for 5 - 7 minutes.. Remove from the oven, sprinkle with chives and enjoy!